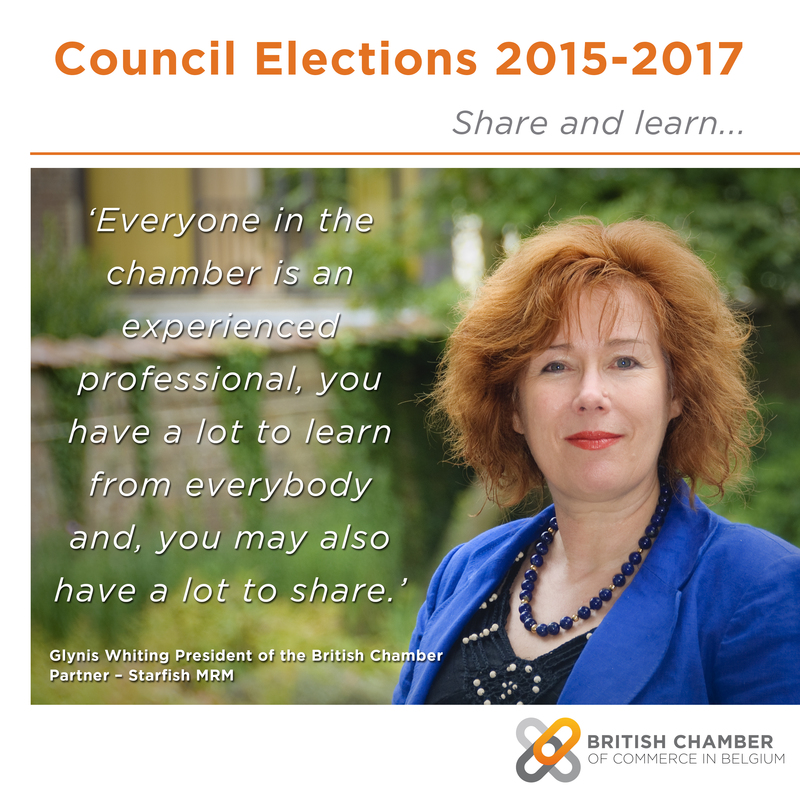 Today the British Chamber has launched the Council and Presidential Elections 2015-2017. Glynis Whiting, our incumbent President, has written about the successes and progresses she has been a part of as her four years of being President of the British Chamber. For more information on the Council nominations process and timeline, please follow this link. If you’re interested but want to know more about being a Council member, or standing for President, contact Glenn for an informal discussion. I first became involved with the British Chamber over 10 years ago whilst I was running a regional representation for West Midlands which covered both the public and private sectors. I joined because I wanted to connect with the private sector in Brussels and the chamber was the obvious starting point. After contacting Glenn, whom I’d met when he was running the Wales Office, I was quickly drawn into membership and soon found myself becoming chair of the Membership & Communications group. Being an active member enabled me to better get to know sectors of which I had little direct experience; for example, public affairs consultancy. Everyone in the chamber is an experienced professional in their own right; you have a lot to learn from everybody and as you grow with the chamber, you may also have a lot to share. Membership has been invaluable as I was setting up my own business some 5 years ago, not least because my client-base has been largely generated via other members of the chamber: it is instant power networking. You only get out of organisations like this as much as you are willing to put in; as an active member your business as well as your personal network can benefit greatly. When I was elected President, the chamber was just beginning a process of transformation which I helped to kick-off. With full support from Glenn and his team, as well as other Council members, I feel that we have created an unrivalled chamber for international business with a clear vision for the future. This has been member driven from the start through our Chamber 2020 strategy, with various discussion and focus groups contributing how they wanted to see the chamber develop. Now, 4 years on, we have doubled the size and scope of the chamber which has enabled us to reinvest back into a new young and talented team, as well as our new online operating systems, all of which have made, and continue to make, huge differences to our members’ experiences. The successful chamber experience has been the catalyst to developing my own company which now specialises in online systems transformation for membership and professional organisations. Seeing the chamber’s transformation over the past four years of being President has been a real privilege. I was especially delighted when last year we regained the COBCOE Chamber of Year award; no easy feat as other chambers throughout Europe have become stronger and the competition has become a lot fiercer. It was a recognition of the whole team effort in-house and by our members – so thanks to all! I have enjoyed working on strengthening the business and trade offer of the chamber. It is very gratifying to honour individual companies who are making significant contributions to the Single Market, so our collaboration with the Embassy and Belgian regions on the Golden Bridge awards, as well as with our sponsors, is a much valued partnership. We have further strengthened our Business Development activity which engages businesses large and small whether through exploring global business themes or through practical support to business with our Accredited Service Provider programme as well as training and skills development for all members via our new Business Training programme. The benefit of being a member of the chamber for my company has been to be on the inside track of the diverse international business community in Belgium, building a network of personal contacts and potential clients that I would not otherwise have had. Many may believe that business is all about competition. However, in my experience, provided you have a competitive professional offer, I firmly believe that the success of the chamber is built on mutually beneficial collaboration.